Feather-filled crafts, and manipulation ideas along with a new song, outdoor activities, and games that will have your group quacking with joy! 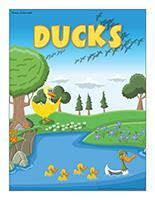 (Open thematic poster-Ducks) Print, laminate, and decorate the walls of your daycare with all kinds of posters. 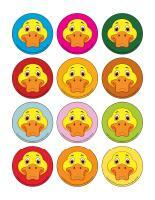 (Open educa-theme-Ducks) Print and laminate. Use the different illustrations to decorate a corner of your daycare and present the theme to your group (and their parents). 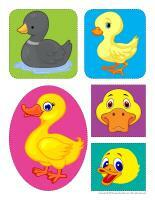 (Open educa-decorate-Ducks) Print, laminate, and cut out the various items. Use them to decorate your daycare and set the mood for the theme. (Open models-Ducks) Print. Let children decorate the items. Cut them out and use them to form a garland that can be hung within your daycare or near your daycare entrance. (Open stickers-Ducks) Print on adhesive paper and use the designs to create a collection of homemade stickers for your group. This document was created in response to a special request received. (Open memo-Umbrella Day) Print and display it to inform parents and children that they must bring their rain boots and umbrella to daycare in case it rains. 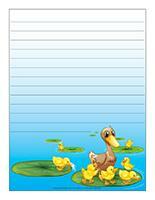 (Open group identification-Ducks) or (Open group identification-Little chicks) Print and laminate the documents. Use them to identify cubbyholes, naptime mattresses, etc. (Open Poni discovers and presents-Ducks) Print, laminate, and cut out the pictures. Use your Poni puppet or another puppet children are familiar with to present the pictures to your group. 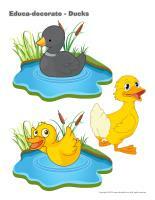 (Open picture game-Ducks) Use the pictures to decorate your daycare or to spark a conversation with your group. Print, laminate, and store the pictures in a Ziploc bag or in your thematic bin. 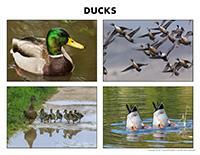 (Open activity sheets-Ducks) Print and follow instructions. 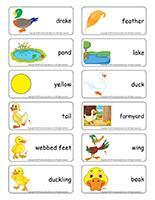 (Open writing activities-D like duck) Print for each child or laminate for use with a dry-erase marker. (Open stationery-Ducks) Print. Use the stationery to communicate with parents, in your writing corner, or to identify your thematic bins. Set your Fisher-Price farm in your area and add tractors and farm animal figurines. Offer natural wooden blocks or pieces of wood left over from your last home renovation project (just sand the corners to avoid splinters). Use Easter straw to represent hay and let children create various constructions on top of it or use the straw to fill their structures. Farm animal prints using cookie cutters. The prints can be colored, cut out, and used to create unique puppets. Plastic farm animals that can be dipped in paint and then pressed on paper to create animal tracks. Farm-related stamps and ink pads. A large piece of white paper on which children can draw their very own farm as part of a group project. A farmer's costume: straw hat, checkered shirt, rubber boots. Decorate your area with pictures of farms and farm animals. Transform your area to create your very own puppet theatre. You'll be amazed by the fascinating stories children can invent with just a cow, a sheep, and a duck as puppets. Memory game related to farm animals. Use a store-bought version or make your own using the educatall club's picture game. Board games or lotto games involving farm animals. Black and white modeling dough for creating cows, brown modeling dough for sheep, and yellow modeling dough for ducks. This is the perfect time to make your own homemade modeling dough and let children mix the colors to create unique farm animals. 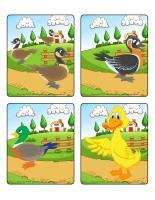 Association game in which children must match various animal sounds to the correct animal. Association game where children must reunite farm animal families (example: rooster, hen, chick). Ask around to see if anyone knows a farmer who would be willing to lend you farm equipment or tools (pitchfork, saddle, milking machine, etc.) so you can explore them with your group. Storybooks about farm animals. You can invite children to share their favorite books with your group. Deposit a few stuffed farm animals in your area. Children will love to cuddle with them. A song box filled with cards on which the titles of different farm animal songs are written. A story throughout which children must make the corresponding animal sound whenever they hear you pronounce the name of a farm animal. Have fun imitating a variety of different farm animals. A water table with a variety of farm animal figurines. Farms animals in a bin filled with hay or Easter straw. Container filled with oats and farm animal figurines. 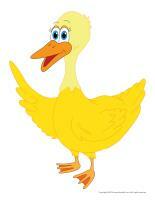 Help children identify words that rhyme with "duck" (tuck, luck, pluck, stuck, truck, etc.). (Open felt board-Ducks) Print. Glue four pieces of white felt on a large piece of cardboard and display your felt board on a wall. Trace and cut out the various shapes related to the theme. You can use your felt board throughout the year by simply changing the shapes according to your different themes. (Open game-This is my spot-Ducks) Print two copies of each illustration. Use adhesive paper to stick one copy of each illustration on the table. Place the second copy in a bag. Children take turns picking an illustration to determine where they must sit at the table. You may also use the illustrations to determine children's naptime spots or their place in the task train. 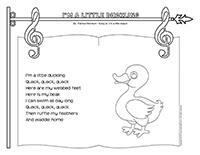 (Open my duck path) Print, laminate, and secure the illustrations on the floor of your daycare to create a path leading to the areas frequently visited by children throughout the day. The path can lead to the bathroom, the cloakroom, etc. If you prefer, use the illustrations to delimit various areas. (Open lacing-Ducks) Print, laminate, and make holes around the contour of each shape. Children can use string or shoelaces to lace the shapes. Children sit in a circle. 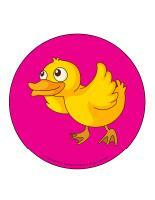 Select a player who will walk around the circle gently tapping each child's head, saying "duckling". 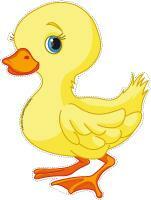 When he/she is ready, he/she taps a child's head and says "Mother Duck". This child must quickly stand up and pursue the first child around the circle. If he/she catches the first player before he/she sits down in the second child's spot, the first player must start over. If the first player successfully sits down in the second child's spot before he/she reaches him/her, the second child must walk around the circle, tapping each child's head and saying "duckling" and so on. Children must roll an egg across the floor, pushing it with their nose. To make this egg race more difficult, you can set up an obstacle course through which children must successfully move their egg, once again pushing it only with their nose. Use colourful adhesive tape to draw a start and finish line approximately 10 cm apart. Give each child a drinking straw and have them blow through the straw to make their feather advance towards the finish line. Allow children to race against each other two by two. The winner of each race may start over with another competitor. Have children form a circle, standing around a blanket or parachute. They must firmly hold the edge of the blanket or parachute. Deposit feathers on the blanket or parachute and encourage them to lift their arms above their heads to send the feathers flying through the air. Observe the feathers as they flutter to the ground. Enjoy this simple relaxation activity with your group. Play quiet music and invite children to pretend they are little ducklings hatching out of their egg. Organize a series of races in which children must move about like different farm animals. For example, they can hop like rabbits, waddle like ducks, walk like a chicken, etc. Gather your entire group (and invite parents to join you at the end of the day) and perform the traditional duck dance. Have children stand single file. You are Mother Duck, at the head of the line. Your ducklings (the other children) must follow your every move. (Open educa-symmetry-Ducks) Print. Children must color the picture on the right to make it look exactly like the picture on the left. (Open Hunt and seek-Ducks) Print and laminate. Children pick a card and search for the item in the scene. 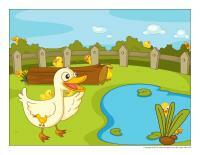 (Open educ-maze-Ducks) Print and laminate for durable, eco-friendly use. Children must find the correct path, the one that will reunite the Mother Duck with her ducklings. (Open puzzles-Ducks) Print, laminate, and cut out the pieces. Children must assemble the pieces to complete the scenes. Hang a piece of green construction paper and a piece of blue construction paper on a wall. Cut pictures of animals out of magazines and encourage children glue them on the green construction paper if they live on a farm or on the blue construction paper if they live in the water. 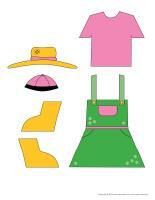 (Open dress-up dolls-Farmers) Print and laminate. Leave the pieces out on a table. Children will enjoy using them to dress the doll. Before naptime, help each child find a partner. Give each child a feather and show them how they can use it to gently tickle their partner's skin. Fill a container with wood chips and add figurines (chickens, horses, sheep, pigs, chicks, rabbits, a farmer, etc.). Children will have fun manipulating the figurines and inventing stories. Fill a container with feathers and let children manipulate them and use them to tickle each other. 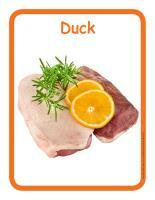 (Open educ-poster-Duck) Print and laminate the cards to present the food item of the week to your group. The cards will help them discover different forms of this food item. Display them in your kitchen area or next to the table where children eat. Purchase several duck-shaped cookie cutters in different sizes. Use them to create duck-shaped sandwiches, cheese slices, and cucumber slices. Enjoy your duck picnic! (Open puppets-Ducks) Print the puppet models on heavy cardboard. Invite children to cut them out and decorate them with various materials. Attach a Popsicle stick to the back of each model to create a puppet. (Open I am exploring colors-Yellow) Print, laminate, and display in your arts & crafts area. With your group, explore this color. Provide several different colors of paint (except yellow) and ask children to try to combine colors to create yellow paint. After a while, explain that yellow is a primary color and that it is therefore impossible to create yellow paint by mixing two other colors of paint. (Open models-Ducks) Print the various models and use them for your various crafts and projects throughout the theme. (Open models-Ducks) Print, cut out, and decorate the ducks with glitter, lace, ribbon, cotton balls, confetti, etc. Glue them back to back on either side of pretty ribbon or string. Hang the mobile from the ceiling. (Open craft-Mr. Duck) Tear, crumple, and glue yellow, orange, and white tissue paper all over the duck's body. Add feathers. Assemble Mr. Duck using fasteners or with short pieces of string or ribbon. (Open mandalas-Ducks) Print for each child. Encourage children to color the mandalas to help them relax at specific times during the day or week. (Open models-Duck) Print for each child. Deposit several feathers or colourful cotton balls in the centre of the table. Ask children to glue them all over their duck. Each child's duck will be unique. Encourage children to identify the differences. Organize a painting activity for your group, but instead of providing traditional paintbrushes, give each child a few feathers they can use to spread paint on their paper. Following a group discussion about where ducks can be seen in nature, create your very own duck pond by gluing a variety of elements on a large white paper banner or a few pieces of cardboard. Encourage children's creativity to see how they choose to represent ducks and water. 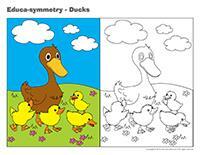 (Open coloring pages theme-Ducks) Print for each child. (Open I am learning to draw-A duck) Print and laminate the model sheet. Encourage children to practice their drawing technique on the model sheet before trying to draw a duck on their own.